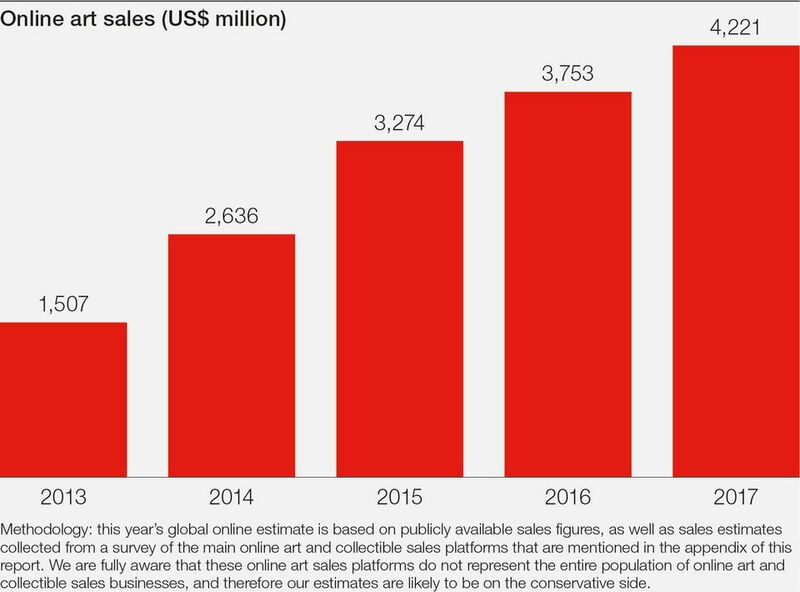 Online art sales reached an estimated $4.2bn in 2017, up 12% year on year, this is lower than the 15% increase experienced in 2016, or the 24% rise in 2015. “Despite the online art market growing around 20-25% between 2013 and 2015, the last 24 months shows signs of a slowdown, perhaps as the industry struggles to broaden and grow its online client base,” the report says. “In a world where online consumers can easily compare prices for most goods, and where ‘value’ is more universally understood, the online art market has a real challenge… when it comes to educating and creating confidence among new online buyers,” says Anders Petterson, the founder of ArtTactic. “Unless these issued are better addressed, I believe the online market will stagnate further, and risk becoming a club for the already converted, rather than a platform for broadening the art market—and its buyers—beyond its current boundaries,” he adds. Price transparency is key for new buyers, 73% of whom say they would like to have access to comparable prices, and the report stresses that better price comparison tools must be made available. “The advent of big data combined with artificial intelligence could present more sophisticated ways of measuring the value of an object,” the report concludes. Crucially, industry opinion is divided over how the online art market will pan out over the next five years. Four in ten respondents believe it will narrow towards a few global platforms; others think that an outsider, such as Amazon, could disrupt the market. However, there are some silver linings. Around 52% of buyers who bought online in the past year say they will buy more art in the next 12 months. Thirteen percent of the 130 dealers and galleries canvassed expect online sales to grow by 30% in the next year. Online art market could stagnate unless transparency is improved, study finds | The Art Newspaper.